I’ve never made any secret of my huge enthusiasm for the music of the Russian Nationalist school – the “Mighty Handful” and their successors – and I’m really looking forward to reviewing the Royal Academy of Music’s production of Rimsky-Korsakov’s A May Night on Monday. Along with its wintry, similarly Gogol-inspired sister-piece Christmas Eve, it’s my favourite of Rimsky’s operas – its gorgeous little overture was a highlight of my father’s Melodiya LP collection when I was growing up – but UK productions are very few and far between. The Russian nationalist-romantic composers have suffered disproportionately in the great narrowing of the standard repertoire that’s taken place in recent years, to the point where even an unarguable masterpiece like Borodin’s Second Symphony is now an exotic rarity in the concert hall. And of course the situation’s far worse for opera, making this student production doubly welcome. This’ll be the first time I’ve actually seen it staged, and I’m chuffed that my father’s able to come along too, after all these years of knowing it only from vintage Russian recordings. To get in the mood, I’ve been looking through my personal Rimsky archives. His My Musical Life is one of my all-time favourite musical memoirs, and I’ve been waiting for years for someone to commission me to write about Rimsky, Borodin or Balakirev – to little avail. Here, though, is a programme note I wrote back in 2001 (so forgive the slightly classroom-y style; I was finding my feet) for Rimsky-Korsakov’s Third Symphony. Inevitably, this wasn’t for a professional orchestra but for my beloved Wrexham Symphony Orchestra (I was playing in the cello section), with Mark Lansom conducting. I’m not aware of a single UK professional performance of this fine work in the 15 years since. Musicians in late 19th Century Russia divided into two camps. The composers of the Moscow school, led by Anton Rubinstein, were trained along western lines and wrote symphonies, sonatas and concertos on the model of Mendelssohn and Schumann. But from the early 1860s a very different group of composers gathered around Mily Balakirev in St. Petersburg. Devoted to the memory of Russia’s first great composer, Mikhail Glinka, they were motivated by ideals of national pride and sought to create a music that was distinctly Russian in character, preferring to avoid western models. They were also amateurs. Of the so-called “Mighty Handful” – Balakirev and his four closest followers, Cui, Borodin, Mussorgsky and Rimsky-Korsakov – none had received any significant formal training and only one, Rimsky-Korsakov, made a full time career out of music. They were fiercely defensive about their abilities and beliefs, and about their independence of Russia’s “westernised” musical establishment. So when a member of the “Handful” set out to write a symphony, he was making a very public point about his technical skill and his ability to match western composers on their own terms. No composer was more aware of this than Rimsky-Korsakov. In the summer of 1871 he was offered an appointment as Professor of Practical Composition and Instrumentation at the St. Petersburg Conservatoire. Despite having two symphonies and numerous other major works to his credit, he wrote that “at the time I could not even harmonise a chorale; not only had I not written a single counterpoint in my life but I had hardly any notion of the structure of a fugue…my ideas of form were vague… even though I had orchestrated my own music so colourfully, I had no idea about string technique or the transpositions of horns, trumpets and trombones”. Rimsky worked furiously to make up the deficiencies in his training, keeping just one step ahead of his pupils, and by the end of his 30-year Conservatoire career he was one of the most respected teachers in Russia. But in his early years he was intensely aware of his limitations. He’d written symphonies before, but the First had been a student exercise, dating from his time in the Russian navy, and the Second, “Antar” had effectively been a symphonic suite. Writing a new symphony, in the best classical manner, seemed an excellent way to develop the new skills he was so rapidly acquiring – and would give public proof of his professional competence. He began composition in spring 1873. “Work was slow, however, and beset with difficulties. I strove to crowd in as much counterpoint as possible; but being unskilled in it and hard put to combine the themes and motives, I drained my immediate flow of imagination. The cause of this was, of course, my insufficient technique…” The symphony was completed on 18th February 1874, and, even with his own reservations, Rimsky-Korsakov must have been a little disappointed with the guarded reaction of his musical friends. Borodin called him “ a professor who has put on his spectacles and composed ‘Eine Sinfonie in C’ fitting such a title”. Mussorgsky’s reaction was less moderate: “The ‘Mighty Handful’ has hatched into a horde of soulless traitors!” Only in 1875, after the first Moscow performance, did the new symphony receive an enthusiastic review. The critic was Tchaikovsky, and Rimsky-Korsakov evidently had enough faith in his judgment to “compose the Symphony anew” in the summer of 1886. It is performed in this revised form today. The Third Symphony is a far more “Russian” work than its early detractors allowed, and is anything but cold or academic. It bears a striking resemblance to Balakirev’s magnificent First Symphony (1898), with which it shares its key-signature and movement-plan, and it’s quite possible, since Balakirev spent an astonishing 32 years writing his work (and the “Handful” regularly shared their work-in-progress) that the two Symphonies influenced each other. Rimsky certainly heard Balakirev play many of his early symphonic sketches in the 1860s. In its own right, though, it is a hugely appealing and enjoyable romantic symphony. Although none of its main themes are actual folksongs, they have an unmistakably Russian cut, and the orchestration glows throughout with Rimsky’s colourful and very distinctive brass and wind writing. The individual movements, too, are anything but formal academic exercises. The vigorous main theme of the first Allegro is a transformation of the flowing, chant-like “motto theme” which opens the symphony. The sweet second subject, introduced by a touchingly hesitant solo clarinet, strikes a note of real feeling, and goes on to provide the main material of the development section. This is anything but a conventional sonata-movement, however, and after a powerful recapitulation of the motto theme the movement proceeds, not to a grand C major coda but a quiet wind-down to a sombre C minor conclusion. The Scherzo is also highly original, not so much in form as in thematic material. It is in 5/4 time; as Mark Lansom has pointed out, possibly the first symphonic movement ever to be set in this time signature, predating comparable movements in Borodin’s Third and Tchaikovsky’s Sixth symphonies by well over a decade. Rimsky-Korsakov had sketched it in 1863; the sinuous Trio section had a rather more immediate personal association – he’d conceived it on an Italian lake steamer during his honeymoon in the summer of 1872. Written in a warm E major, the Andante follows the formal pattern pioneered by Glinka in his Kamarinskaya, one of the musical touchstones of the “Mighty Handful”. Russian folk-melody doesn’t lend itself to development so Glinka simply repeated his themes in ever more varied orchestral colours, and this is exactly what Rimsky does with the very folksy principal subject of his slow movement. The tempo increases briefly in the centre of the movement and then relaxes again before accelerating into the Finale, which follows without a break. The processional melody for full orchestra that launches the movement soon acquires a more lively syncopated profile with a distinct whole-tone flavour, and this, together with a lyrical second theme in canon, provides the material for another spirited Rimskyan essay in sonata form. As the symphony approaches its close, Rimsky-Korsakov pays one more tribute to Glinka by quoting the descending whole-tone scale from his “Ruslan and Ludmilla” overture and ends with the triumphant C major peroration he denied us in the first movement, the “motto theme” with which the symphony opened pealing out in the brass amidst the general jubilation. No reviews this weekend – here’s what I was doing instead. I’ve been playing on and off with the Wrexham Symphony Orchestra since 1997. I love them not just because they’re a friendly bunch but because they have such a thirst to explore the repertoire – to “have a go”. They play music that excites them, and there are no finance managers, critics or jaded pros there to tell them that amateur orchestras can’t play Mahler 3, Nielsen 1, Prokofiev 7 or Bruckner 5; or Paul Creston, Bernard Herrmann, Lars Erik Larsson, Alun Hoddinott or Jean Francaix. So they just play it, and I’ve had some of the best musical experiences of my adult life at the William Aston Hall. I’m always frustrated when work or travel (it’s a bit of a trek from Lichfield to Wrexham) causes me to miss a show. But there was one concert that I was determined not to miss – the Resurrection Symphony, the highlight so far of the Orchestra’s 10-year Mahler cycle. 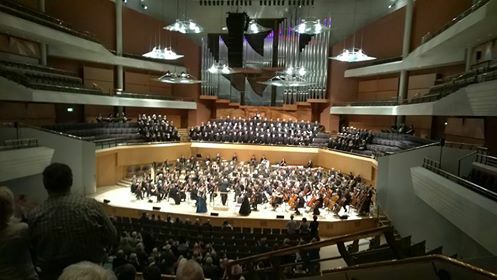 For the occasion, the orchestra had hired the Bridgewater Hall, Manchester – the biggest and most high-profile venue it’s ever played in – and teamed up with no fewer than four Cheshire and North Wales choral societies. 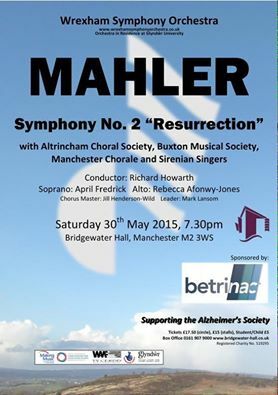 Richard Howarth – formerly of the Manchester Camerata – conducted. 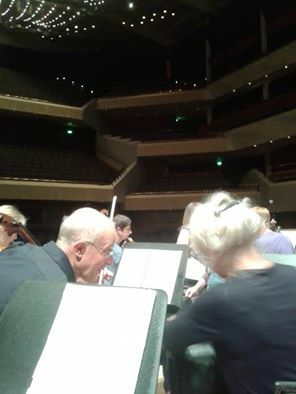 So there I was, at the back of the cello section, as astonished as anyone in the orchestra by the transformation that the Bridgewater Hall acoustic wrought on our sound and quietly relieved that after a week of rehearsal, my creaky fingers were finally starting to produce something resembling Mahler’s cello part. It was a welcome reminder, too, of the unique perspective that you get on a piece of music once you’re on the inside, as it were – actually playing it. It’s incredible how clearly the form of the piece simply lays itself out in front of you as you play – and the details you notice. I was shocked at just how lazy my listening had become. When, in listening to the first movement, had I ever genuinely noticed the passage where Mahler semi-quotes (or at any rate, evokes in unmistakable terms) first Die Walkure, and then Tristan? And later, a huge subito piano tutti clearly cribbed from the end of Gotterdammerung? There they all were, jumping off the page at me as, with one eye on the baton, another on the semiquavers on the next line, I struggled not to run out of bow.